In the fun video below, Bernard Shondell shows you how to capture the sweet taste of the season with an easy (and edible!) cookie tree that looks just like our 2015 Season’s Treatings Keepsake Ornament. 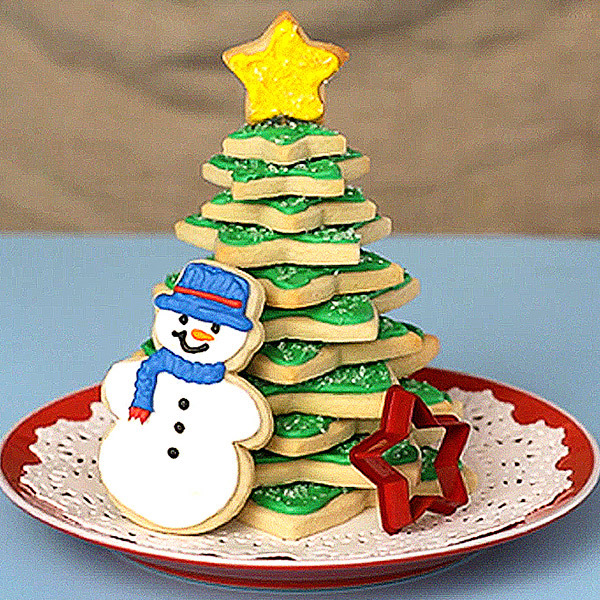 Made with stacked sugar cookies, this Christmas cookie tree makes a festive centerpiece or homemade food gift. Preheat oven to 350°F. Place dough on a lightly floured surface and cover with wax paper. Roll dough to ¼-inch thickness. Cut out 12 star cookies total: 1 to 4 of each size, depending on how many different star-sized cutters you have. Cut out 1 snowman shape (optional). Re-roll dough scraps as needed to cut out all the cookies. Remove cookies from oven and let them fully cool on cooling racks before decorating. Tint a small amount of icing yellow for the star. Frost the smallest star and add coarse sanding sugar. Let dry. If adding a snowman to your finished tree, leave a bit of the icing white, and tint small amounts in the colors you want to make your snowman scarf, hat and face (optional). Use toothpicks for adding the face details. Tint the remaining icing green. Spread the green icing over the remaining 11 star cookies and then add sanding sugar. Let all the cookies dry. Cover the bowl of remaining icing with a damp cloth or place the icing in an airtight container while the cookies are drying so you can use it as “glue” to hold the cookie tree together later. When the star cookies are ready to be assembled, place the largest star on the center of a plate. Use a dab of icing on the base of the plate to keep the cookie from moving around (optional). Begin stacking the cookies on top of each other, largest to smallest, using a dab of icing in the center of each cookie as the glue. If the cookie tree begins to wobble during assembly, let it dry for a while before you add the remaining cookies. Once assembled, add the star by inserting half of a toothpick into the side of the yellow star cookie, and then inserting the other end of the toothpick into the center of the top green star cookie. To make it look just like our adorable 2015 Season’s Treatings Keepsake Ornament, place your snowman cookie and a small star cookie cutter against the cookie tree as additional decoration (optional). I put my cookie dough into 1-gallon zip-top plastic bags to chill. Use silver-colored baking sheets without edges. Decorating the baked cookies the next day is ideal—if not, try to wait at least a few hours after they’ve come out of the oven.